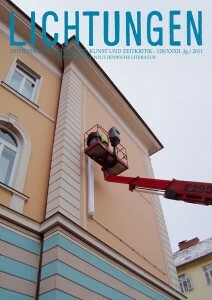 In the year of European capital of culture 2012 in Maribor, the literary magazine Lichtungen continues their year-long partnership between Graz and Maribor with an extensive cross-border literary project. Edition 129/2012 thus features selected texts by twelve authors from both Maribor and Graz, in Slovenian and German, presented through four readings – two in Graz and two in Maribor. Authors presented at KIBLA: Olga Flor, Valerie Fritsch, Wilhelm Hengstler, Reinhard Lechner, Friederike Schwab, Birgit Pölzl. Slovenian translations read by Ana Jasmina Oseban and Daniela Kocmut (Graz). © 2012 KIBLA MARIBOR 2012. All images are copyrighted by their respective authors.